I nearly did a double take. Rockefeller Music Hall? Why would a Norwegian progressive metal band travel to New York to record a live album. Duh. Brain cramp. Not the Rockefeller Center in the Big Apple, but the legendary venue in Oslo, the converted public bath house. Live At Rockefeller Music Hall is Leprous' first live recording audio or visual, and they do it before the hometown crowd. Wise. But here's my thing. 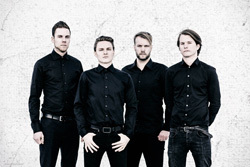 I don't particularly like Leprous. First the name bothers me. Basically "leprous" means being afflicted with the disease of leprosy. How gross is that. Biblical. Unless it has some other meaning in Norwegian, I don't get it. It's right up there with that Swedish industrial disco rock band Dumb Hole. Second, I don't find Leprous' modern progressive metal all that interesting, entertaining, or enjoyable (Although five years ago I gave them a favorable review of Bilateral.) Their songs are mostly heavy with a barrage of riffage, and more riffage. Apparently, the guitarists couldn't differentiate a guitar solo and a bowl of tomato soup. Or maybe I just missed them for all the pummeling riffs. Additionally, the rhythm section is dense to the point of being burdensome. However, one of the best things about this performance are the thundering drums, especially when they use two drummers as within Foe. Also, vocalist Einar Solberg has always been a difficult listen. His voice ranges from moan to whine to monotone crying. And you can't really understand him, yet some members of the audience are seen singing along. 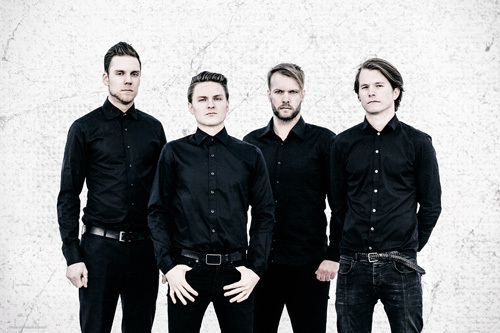 Okay, you say, "You don't like Leprous or their music. What about the live recording then?" Glad you asked. Here's the bottom line: If your a Leprous fan, you're going to want to get this live recording. Both the audio and visual production of Live At Rockefeller Music Hall is quite stunning. (And I say this not viewing the DVD, but the streaming video provided by the label.) To the former, the sound is impeccable. But in the digital age, you shouldn't be able to screw that up. In other words, Leprous "sounds" great in this live recording. Visually, it's the usual stuff, with wide and individual shots of the band playing. The players appear focused on getting the music done, rather than being theatrical showman. Alternatively, though behind a modest keyboard, Solberg tries to be both passionate and dramatic, even romping around the small stage. Yet the significant visual part is not the band, but the integration of the visual imagery created by longtime visual collaborator Costin Chioreanu. This integration and presentation isn't quite up to the standards of, say, recent Rush tours, but it certainly adds more contextual drama. So, again I say, if you're a Leprous fan, definitely get the Live At Rockefeller Music Hall DVD package. It also comes with bonus materials such as "behind the scenes" stuff, official music videos, and a video of an appearance at the same venue some thirteen years earlier. It also comes as digital download, two CD set, and three vinyl set. 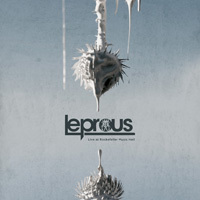 If your a Leprous fan, you're going to want to get this live DVD recording. Both the audio and visual production of Live At Rockefeller Music Hall is quite stunning.